Another week is coming to an end and some interesting readings have found there way into my Inbox...after a reminder that the debate on unpaid internships in development is far from over yet and an interesting article with background information on conflict & peace in Mali, the 'theme' for this week is about the future of the humanitarian system - complete with drones, civil-military cooperation and new non-Western donors. Reflections on the use of open development data, reflexivity and a new autobiography of a great woman Nobel Peace Prize laureate round off the development section. 'Designing for Stories' is a recommended read on how to make participatory exercises better designed and more engaging. Last not least, two essays on neoliberal reforms in higher education in Australia & the UKare featured in the academic section! Are journals hindering creative academic writing & engagement with research? The focus on‘open access publishing’ and ‘better academic writing’ may be overrated when it comes to fostering creative writing, public engagement with research or finding cures to eradicate poverty because the commodity of academic journal articles has limited value outside a relatively narrow circle of academic insiders. In addition to advocating for more open access publishing we should think outside the box of a particular written genre to ensure that the goals we envision to achieve are truly met in today’s digital world. It may be a bit unusual to put a disclaimer at the beginning of a review, but I have the privilege to approach the review of Understanding Development as a bit more than just a reader: Not only do I know the author Paul Hopper from a previous teaching job at Brighton University, but more importantly, while he was finalizing the manuscript, I used some the draft chapters and ‘field tested’ them in an introductory course on international development for undergraduate students. 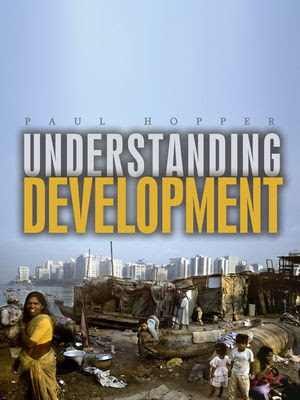 For most of them this was their first academic exposure to international development topics and this is clearly where the core strength of the book lies: It is a very good, but also basic starting point into ‘understanding development’ and it will probably be most useful for undergraduate courses or in teaching environments where students have little or no background in this area. In the brutal reality of the 21st century attention-fueled economy web traffic, clicks, mentions, hashtags are part of the media reality – and they are primarily driven by abstract numbers. When the Huffington Post claims that SI is ‘getting a lot of buzz for the wrong reasons’ and then include a 52 image series ‘Relive past Sports Illustrated Swimsuit issues’you are essentially learning a lesson in media hypocrisy. This week, the highlights of the link review are distributed evenly across the three sections: In Development there are interesting debates on 'Generation Z' & HR, the ethics and value of 'big data' and why policy-makers like to embrace 'uncertainty' unless they actually have to make a decision...This month's Himal Mag features an article from Sri Lanka that reminds peace researchers that violence often affects 'post-conflict' societies in many different ways than the actual war; in Anthropology there's a very interesting essay on Napoleon Chagnon and the long-lasting debates around his research on the Yanomami tribeand how it has kept the discipline busy over many years; and in Academia the Thesis Whisperer asksthe provocativequestion whether 'academic assholes' are calling the shots and whether 'circles of niceness' can be a counterweight.